The Olympic Federation of Ireland says it has learned lessons from the events in Rio and is prioritising athletes, their families and the general public when it comes to tickets for the Olympic Games in 2020. Three years ago the Olympic Council of Ireland, since renamed, was embroiled in a ticketing controversy that overshadowed the Rio Games. The federation says it is a vital element which it wants to get right. "That was very important to us so we did a lot of investigations about authorised ticket re-sellers around the world," Sarah Keane, President of the Olympic Federation of Ireland, told RTÉ Sport as they confirmed Finnish company the Elamys Group as the agent. "For us the priority is not the commercial side, the priority is ensuring that our athletes, their families, the general public are serviced in relation to proper ticketing arrangements and packages that are at a reasonable rate. "The [company] are going to have a presence on the ground, a couple of days a month and then we’ll build on that as we go on. "It’s an Irish individual who is doing that so they are not just going to be on the other side of Europe, so to speak. "Whether we got it right or not will show over the next 18 months. We believe we’ve done a good process. "[The Japanese people] are mad about this Olympics so there’s going to be a lot of people wanting to get tickets so we are going to have to try and ensure that people who are interested can get there." Full details about ticketing will be available from May and June, Keane added. 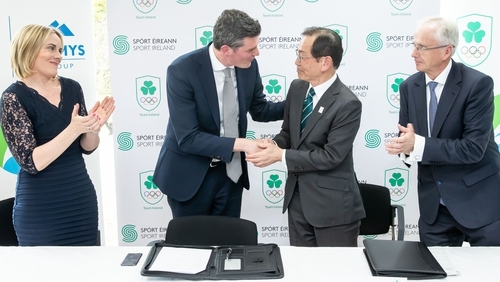 The major of Fukuroi, Hideyuki Harada, was in Dublin today to sign an agreement as his city prepares to welcome Team Ireland for a pre-Olympic training camp in the run-up to next year's event. The city which is about two hours by train from Tokyo will also host Ireland's Rugby World Cup game against Japan in September. Meanwhile, the president also said that they have been given assurances that boxing will be part of the Games, with uncertainty surrounding its inclusion at an end. "The IOC have said to us very clearly that boxing will feature in the 2020 Olympic Games," said Keane. "The detail of who’s running it and how exactly that operates, the qualification process, is something that they’ve said we will receive more information on in June of this year."